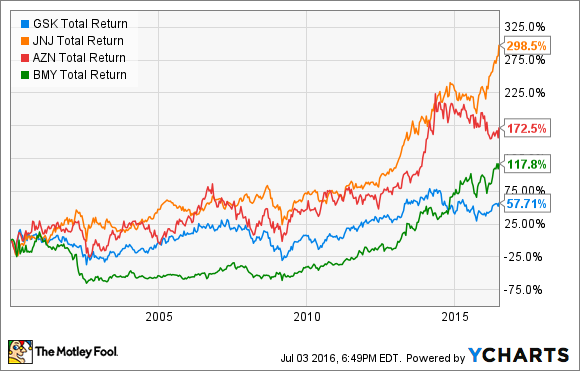 Which Big Pharma Is the Best Dividend Stock? Several Big Pharma stocks have high dividend yields. The best one, though, depends on how you define "best." Want to know how to determine which Big Pharma is the best dividend stock? You could just look at the current dividend yields and pick the stock with the highest one. However, that's not the best approach. The Big Pharma stock with the highest dividend yield now won't necessarily be the one paying the best dividends in the future. Since 2000, the top spot for highest dividend yield among the eight largest pharmaceutical companies has changed at least two dozen times. And seven of those eight companies have held the lead at some point during that period. So how can you find the best Big Pharma dividend stock? It depends on how you define "best." Yogi Berra once said, "If you don't know where you are going, you might wind up someplace else." Berra's maxim is quite relevant to finding the right dividend stock. You need to know where you want to go first to figure out the best way to get there. For example, some investors primarily need stability. They want a dividend payment that they can count on year in and year out. For these investors, volatility in a dividend yield is the enemy. Johnson & Johnson (NYSE:JNJ) would be a great pick for individuals in this category. While J&J's current dividend yield of 2.64% places it near the bottom of the eight largest drugmakers, the company has increased its dividend payments for 54 years in a row. That's the kind of track record you can feel good about. 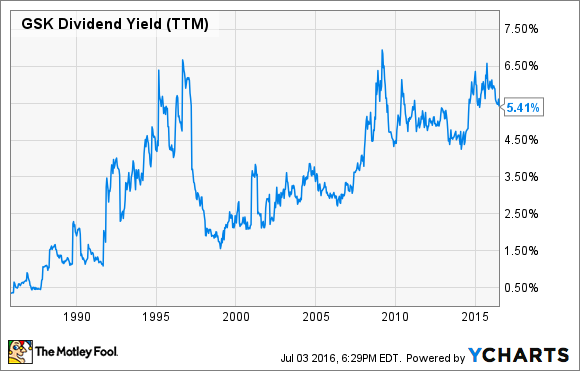 Others might accept some volatility as long as the dividend yield is typically high. GlaxoSmithKline (NYSE:GSK) looks like a good fit for those investors. Glaxo has cut its dividend payment a few times, but the yield has often been among the highest of all the Big Pharma stocks over the past several decades. GSK Dividend Yield (TTM) data by YCharts. Glaxo held the top spot for highest dividend yield at some point during eight of the last 17 years. AstraZeneca and Bristol-Myers Squibb tied for the No. 2 position, with both stocks having the highest yield at some point during six of the last 17 years. While it makes sense for income-seeking investors to focus heavily on dividends, don't lose sight of the big picture. A stock that pays a great dividend but also has its share price decline might not make you as much money over the long run as a stock that has a smaller dividend but increases in price. For example, Johnson & Johnson provided the highest total return (including share price increases and dividend payments) of the eight largest Big Pharma stocks since 2000. You might have received more dividend payments from Glaxo during those periods, but you would have made significantly more money overall from J&J. GSK Total Return Price data by YCharts. The time period you look at makes a difference in total return, though. If we focused only on the last 10 years, Bristol-Myers Squibb wins the prize. If you read the fine print on a mutual fund prospectus, it will say something like, "Past performance does not necessarily predict future results." That's true for mutual funds -- and it's true for Big Pharma stocks also. That's why finding the best dividend stock requires more than merely looking at historical charts. Having said that, though, history matters if for no other reason than it indicates the priority that a company places on its dividend payments. It wasn't an accident that GlaxoSmithKline held the top position for highest dividend yield so frequently during the last 17 years (and stands at the top of the list right now). Glaxo made its yield a priority. Likewise, it's certainly not a fluke that Johnson & Johnson increased its dividend each year for more than half a century. The key question to ask is: Do the business fundamentals for the company point to the likelihood of similar results in the future? For both Glaxo and J&J, I'd say the answer to that question is yes. GlaxoSmithKline continues to experience the pain of declining Advair/Seretide sales. However, the company's new products are coming on strong, especially HIV drugs Tivicay and Triumeq. Glaxo's pipeline also looks solid with 15 late-stage studies in progress. As for Johnson & Johnson, around 70% of the company's revenue comes from products that hold the No. 1 or No. 2 position in their respective markets. J&J's drug pipeline includes over 30 late-stage programs in the U.S. alone. And while the company qualifies as a Big Pharma stock, it's also a "Big Medical Device" and "Big Consumer Products" stock. 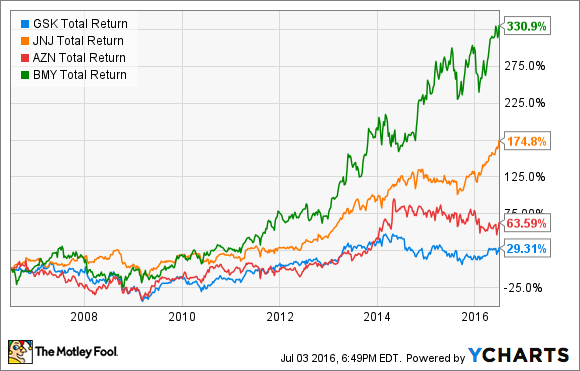 Which Big Pharma is the best dividend stock? It depends on what your needs are. For pure yield, Glaxo looks to be the best pick. For overall returns and long-term stability, you won't go wrong with J&J. That's been true in the past, and (more importantly) should continue to be the case in the future.